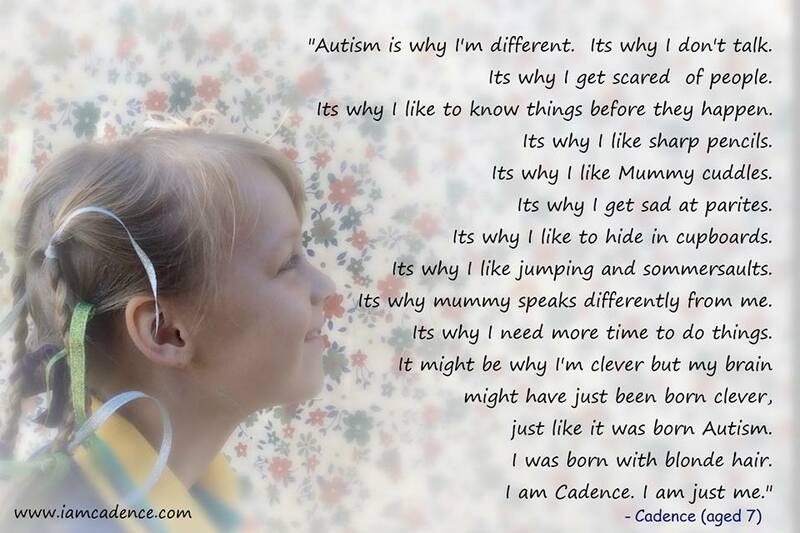 “I am Ca dence” is the website of 10 year old Cadence – author of short pieces describing her experiences of being an Autistic child. Her published writings include “Autism is why I am different”, “When I’m Grown up”, “Autism Doesn’t mean I’m bad”, “Green Day’s make me feel Yellow”, “I survived” and “Cadence’s Ingredients”. Cadence is an active, playful and bright 10 year old girl diagnosed with ‘Autistic Disorder’ (commonly known as ‘Classic Autism’). Cadence delights in writing, twirling, patterns, counting, and painting. She has a great love for animals, being outdoors and all things princess and fairy. Her first public piece, ‘Autism is why I am different’, published by Kidspot magazine in August 2015 when Cadence was just 7 years old, has since been made into a Spanish short film, ‘Acceptance’ (released August 2016). Since then, Cadence has written a number of other short pieces published by both mainstream and social media sites, blogs and in selected books. You can visit Cadence’s Facebook Page, ‘I am Cadence’ here. Selected parenting articles and parent resources to support parenting Autistic children.